Why Charter Over Under Adventure? We Fish for Billfish and Tuna Year Round! Fish with the boats and crews that are out there day in and day out, year round. We have some of the best tournament boats around, and you'll be sure to compete. Imagine having four times the amount of information, time on the water, and expertise to draw from....that's why we encourage you to fish with OUA when it comes time to book a tournament charter. If you are interested in a Mid Atlantic 500 Charter or an Ocean City White Marlin Open Charter, please call us as our boats are available to fish these tournaments! 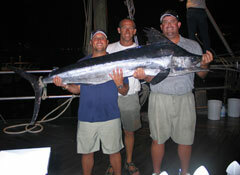 If we do not book the entire boat, we will do individual spots for tournament charters. Please check out our OPEN BOAT TOURNAMENT web-page for details. 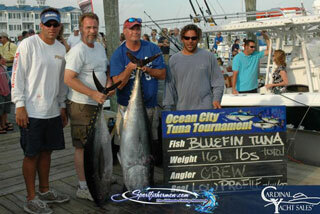 The Ocean City Tuna Tournament and Mid Atlantic Tuna Tournament are great picks for winning some money! We also now have two boats available for the Cape May Shark Tournament. This winter and spring, we have multiple boats available and competing in most major Florida Sailfish Tournaments and Florida Dolphin Tournaments, and all the major North Carolina Fishing Tournaments including the Big Rock and Hatteras Offshore Village Open..
Pictured Right, the 511 Pound Blue Marlin that took the Big Fish Prize in the 2011 Hatteras Village Open. Over Under Adventures Takes Second Place in Ocean City Billfish Tournament! READ A BOUT PRETTY WORK'S TUNA THAT TOOK 237,000 in 2006! 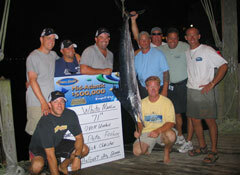 OVER UNDER TEAM WINS TUNA DIVISION AT CAT ISLAND 2 OF LAST 3 YEARS!